Note: There is construction on Highway 94 near the range. Please allow an extra 20 minutes for possible traffic delays! 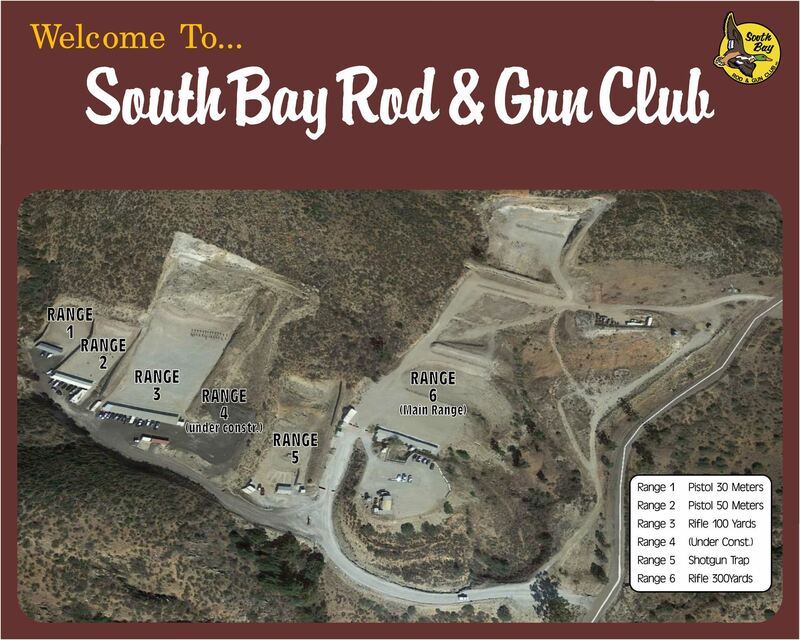 South Bay Rod & Gun Club, Inc. offers many activities to its members and the general public. The range facilities are located a few miles east of Dulzura. We are a private, non-profit corporation formed in 1955. Our Mission: is to operate a properly managed, non-profit shooting club that is efficiently designed, constructed, and safely operated with diligently maintained shooting ranges, support structures, and facilities so that all authorized members and guests may use our facilities with pride, confidence and satisfaction. We endeavor to ensure that future members will inherit a well-managed, top quality shooting venue and a legacy of marksmanship, sportsmanship and friendships. We have five shooting ranges. When open, they are supervised by at least one Range Safety Officer. Check the Calendar to verify which ranges are open on any specific day, also check the Urgent Messages for an unexpected range closure. There are shade covers over all firing lines. All ranges have bathrooms. Ranges 3 and 6 have cold beverage machines. The range facilities can be reserved for use by law enforcement, military units and other groups as approved by the Board of Directors. Our property is a designated wildlife refuge that is home to quail, bobcat, coyote and deer. Any distance out to 100 yards. Targets at distance 50 feet to 100 yards. 2nd & 4th Wednesday of the month 8 a.m. - 11 a.m. Shotgun new shooter Clinic most Saturdays 8 a.m. - 9 a.m.
300 yard range with target frames at 50, 100, 200 and 300 yards. and Sunday at 4:00 p.m.
and Sunday at 5:00 p.m.
7-day Trial Memberships are available for purchase at the range for $30 for Adults/$15 for Juniors (up to age 17). Trial membership fee will be applied to upgraded membership fees if member joins within the 7 day trial period. Club members can purchase rounds of trap/clay targets for $7 per round & books of 20 rounds for $120. Paper Targets: First target free, 50 cents for each additional one.